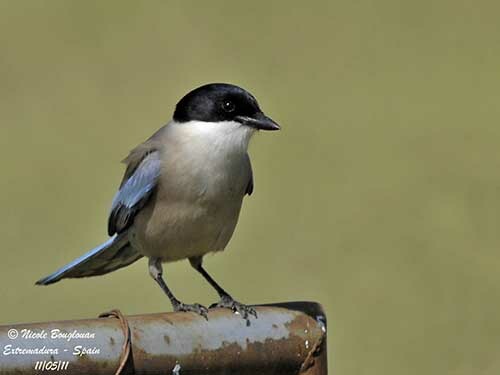 The Iberian Magpie is today treated as a full monotypic species, but formerly, C. cooki and C. cyanus were conspecific. Following several studies between the seven subspecies of C. cyanus and C. cooki, including DNA and morphological analyses, it appears that the morphological data are in accordance with the results of genetic analyses. The difference between western and eastern birds is much higher than among the subspecies of the Asian populations. 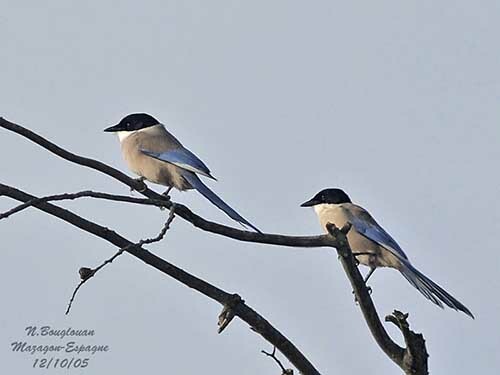 This result rejects the idea of a recent introduction of Asian Azure-winged Magpies into Europe. The Iberian Magpie is probably native to Iberia and not the result of an introduction from Asia. Recent genetic studies indicate two separated species, one in Europa and the second in Asia. In addition, the discovery of fossils of this species, going back to 44,000 years, on Gibraltar in 2000, finally imposed and proved that this species was in the area since a very long time. This discovery is an important argument in the findings. The Iberian Magpie has intense black head and nape extending down under the eyes. The malar area is white, like the throat. The wings are blue, with black inner webs and blue outer webs on primaries. The primaries have white-tipped outer webs, increasing towards the inner primaries. The blue, graduated tail is very long, 190 to 197 millimetres. The rectrices are entirely blue, without whitish tips. The upperparts are pinkish brown, with light grey iridescence. The underparts are pinkish brown too, except the white throat, and the very pale upper breast. Breast sides and flanks are darker, but centre of belly is almost white. The bill is strong and black, typical of Corvidae, but less large than in Pica pica. The eyes are dark brown to blackish. Legs and feet are black. The juvenile is darker and brownish, with buffy tips on the blackish head. The wing coverts are fringed pale buff while the greater coverts are white-tipped, forming a narrow wingbar. The upperparts are brownish, with blue grey iridescence. The tail feathers are blunted and buff-edged. The Iberian Magpie occurs in Spain, except N and E, and in E and S Portugal. 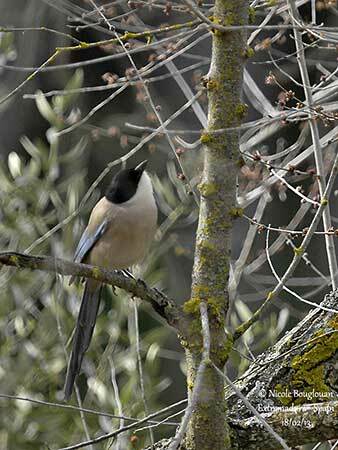 The Iberian Magpie frequents open woodland, orchards and olive plantations. It favours woodlands with oaks (Quercus) and/or pines, usually near streams. It frequents clearings, tracks, roadsides and desert areas with scattered trees, but never far from the vegetal cover where it can hide if threatened, while calling strongly. This species is visible up to 700 metres of elevation in foothill gorges. 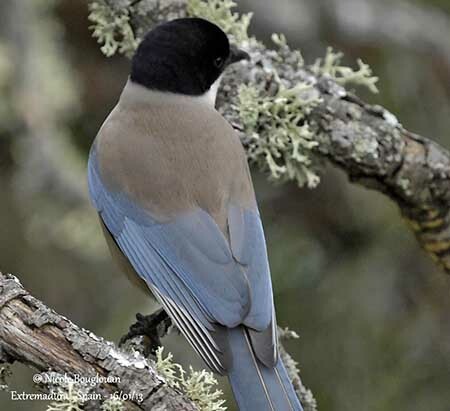 They may form large flocks on coastal wooded dunes with pines in SW Spain. There is some competition with the Eurasian Magpie which is usually dominant, but here, the Iberian Magpie competes successfully. 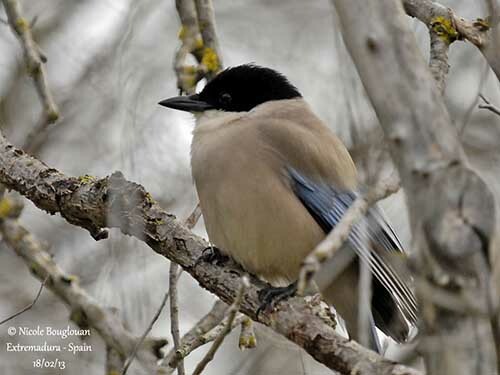 The Iberian Magpie utters hoarse “zschreee”, more rasping than that of C. cyanus, and various repeated clicks while moving among the vegetal cover. If they are scared when in flocks, the Iberian Magpies utter their “rii-rii” calls while moving away. This is probably an alarm call. During the nesting period, the most common call is a strong, raucous “shriii”. The displaying male produces subdued chattering. 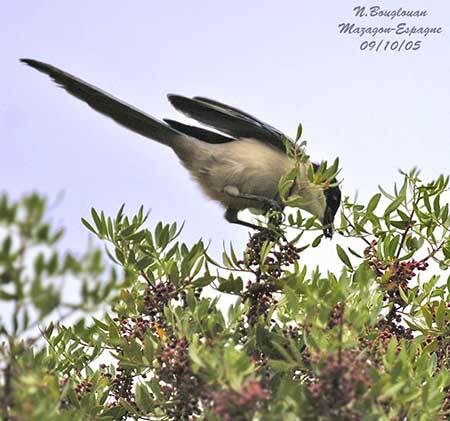 The Iberian Magpie feeds on fruits, berries, insects, seeds, grass stems and small reptiles. It is omnivorous, eating all kinds of food items, but it also likes large insects in spring and summer, and seeds and fruits in autumn and winter, and also carrion. It consumes earth worms and larvae, pine processionary caterpillars, and also flying insects such as flying ants, and grasshoppers of all sizes. According to the areas, it also feeds on acorns and olives. During winter, they frequent human settlements where they raid rubbish dumps and litter bins. It forages and feeds by pecking on the ground. Fruits and carrion are held with the feet and teared with the bill. It pursues and catches easily flying insects. It is able to extract insect larvae from bark crevices. The Iberian Magpie is very noisy and gregarious, living in groups all year round. It is a bird always anxious and noisy, but these continuous calls maintain the cohesion within the group. In the evening, they gather at nightime roosts where hundreds of individuals and even more can be seen. Excessively aggressive in front of danger, especially in nesting period, the Iberian Magpie attacks any intruder, small or large, including human, if they approach the nest. Numerous calls alert the dispersed pairs and groups call together and attack the predator. The Iberian Magpie nests in loose colonies, about 14 pairs within one hectare. The courtship displays start in winter. The male approaches the female with half-opened and vibrating wings, bending the slightly fanned tail towards her. It bows the head and walks aside with alacrity, while turning around the female. These displays are noisy and are performed in dense groups, chasing each other’s on the ground and under the trees, climbing up and down the branches. The male has often erected feathers on the nape. 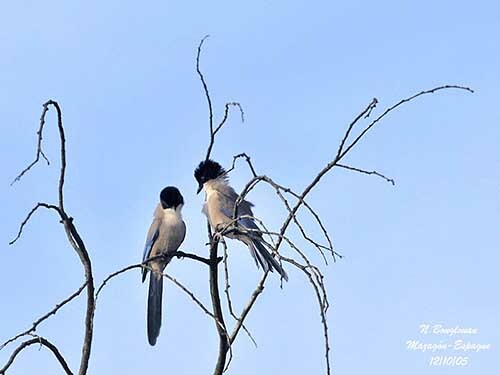 The Iberian Magpie is very sociable in all situations, protecting the young of another pair if they fall from the nest or defending together the nesting area and chasing away all intruders. It is very sedentary, occurring in a wide territory which it leaves only in bad weather conditions. It regularly moves within this area. Some occasional movements can be observed in NE Spain and extreme SW France. The Iberian Magpie has rapid flight with short wingbeats when escaping a danger. 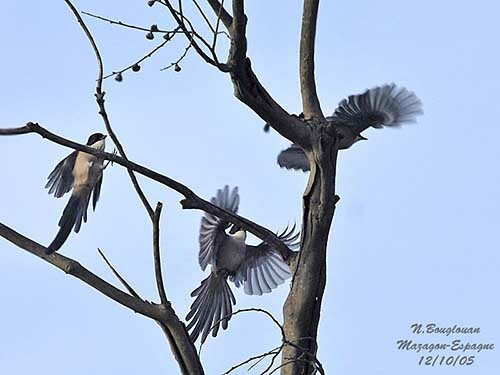 Usually, it flies from tree to tree and rises rapidly to the treetop following a low flight. The Iberian Magpie’s nest is made with twigs equal in size making almost the half of the nest. Lichens, rags and paper form a fine lining under a layer of packed earth of about five millimetres of thickness. The inner cup is made with 60% moss, and small pieces of paper, clothes, bits of wool and animal’s hairs. The nest is built by the female with material provided by male and some helpers. It is placed at variable heights, from 3 to 15 metres above the ground. Most nests are turned eastwards, either on the first branch of a tree, or in the terminal fork of the pines but not higher than 8 metres. The construction lasts between 10 and 15 days. An old nest is never reused. In early June, the female lays 5 to 6 pale buff, greyish, whitish and even greenish eggs, mottled dark and with purplish or grey markings. The incubation lasts about 17 days, by female. The male feeds her every 30 minutes, and removes the droppings from the nest. At hatching, the chicks are covered with very pale and rare down. The female eats the shells in the nest. Adults and helpers feed the chicks by regurgitation, about 5-6 times per hour. The parents’ arrival at nest is greeted by intense squawking, but if the chicks are threatened, the adults alert them with a particular call, and the chicks flatten immediately at the bottom of the nest and keep silent. When they leave the nest, their tail is still short and the wings little developed. At 17 days, they are able to stand up and they move into the branches around the nest, following their parents and begging food. Until 4 to 5 months of age, we recognize the young thanks to their grey head instead of black. The Iberian Magpie’s population tends to become very local and does not increase. 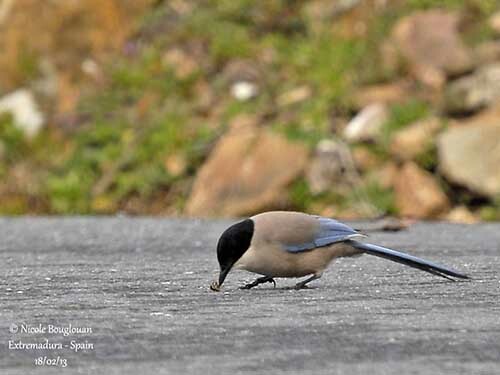 The disturbances caused by human close to the nests do not favour the breeding success which is usually better in southern Spain and Portugal where numbers are suspected to be increasing. However, the global population is declining due to habitat degradation with destruction of extensive stands of oaks in several regions. Competition between this species and Pica pica is another important threat. The population was recently estimated at 40,000 pairs in Portugal, and 250,000 pairs in Spain. 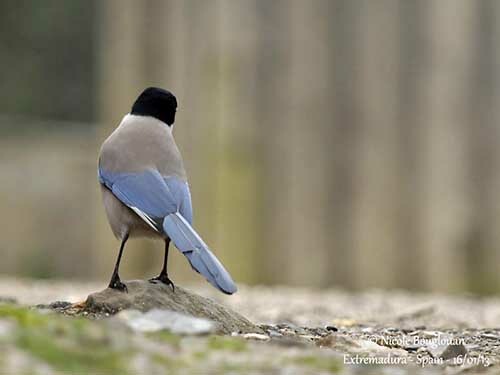 In absence of status, the Iberian Magpie needs to be monitored in the future.